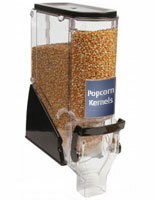 Grains are a staple food in many diets across the world due to their durability, shelf life and great taste. 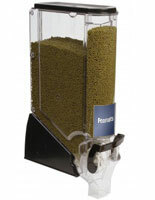 Homeowners and restaurants often keep an assortment of these special little seeds on hand using a gravity powered grain dispenser to dole out portions for shoppers, meal preparation, hot cereal or even to eat raw by soaking and sprouting! Supermarkets, corner stores and other commercial food service establishments use grain dispensers so that shoppers can buy fresh grains by weight instead of in predetermined packages. 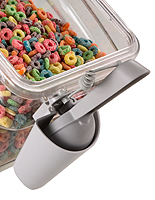 Store oats on the counter and use the self stop handle to pour out the perfect amount for your morning breakfast. 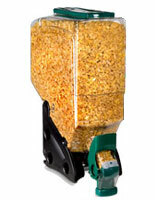 Store wild rice in one of these attractive gravity containers, and dispense out the perfect amount for your casserole or risotto. 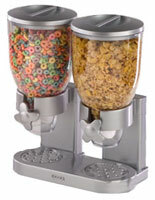 Many people use the words cereal and grain interchangeably. 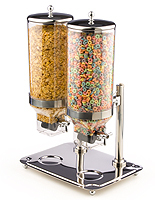 Restaurant and hotel kitchens place a grain dispenser close to the buffet table for guests to dine on popular cereals for breakfast without having to use scoops, ladles or other clumsy instruments that get in the way. 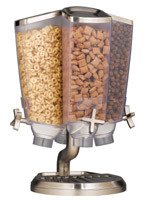 With some of these grain dispensers able to hold up to 34 lbs of barley, oats, rice, rye or other grains, you should have ample storage space for even the busiest of mornings at the hotel! 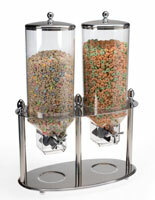 When choosing your new grain dispenser, there are several options and features to be considered. 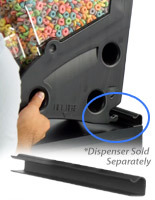 The products on this page are both wall and countertop mounted. 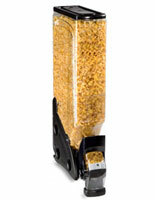 Saving valuable countertop space by purchasing a wall mounted dry storage container is a popular choice for many storeowners and kitchen managers. 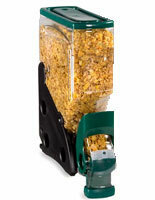 Many of these products are designed with multiple storage containers for situations where several types of grain or other dry food is being dispensed. 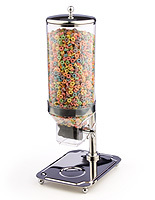 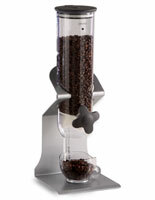 Try one with four rotating chambers to hold your lentils, wheat, oats and quinoa! 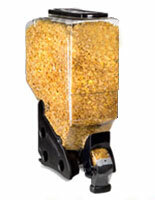 These grain portion control systems have a variety of bells and whistles, including rubber propeller wheels, plastic spouts, metal bases, turn-style knobs, crumb trays and so much more. 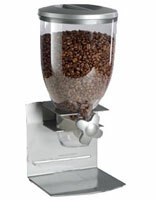 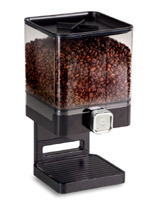 The grain can be dispensed continuously, or portion control mechanisms can stop the flow with one switch of the lever. 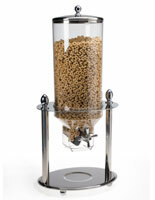 Their air-tight construction ensures that your grains will be kept fresh for a long time. 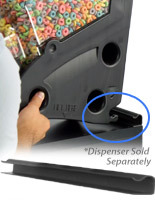 Most importantly many of these dispensers are easily disassembled and dishwasher safe, so as a storeowner who moves large volumes of food, you can be assured that cleaning is hassle-free. 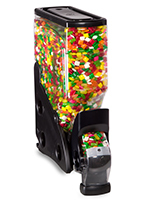 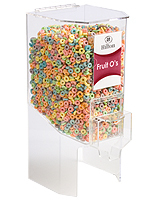 Choose between a variety of colors for your dispenser, including silver, red, black and blue. 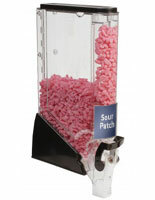 Browse these dispensers and pick out the one that both best complements your interior design and meets your storage needs.